A handy guide to buying flavored rolling papers: flavors, shapes, sizes, and more. If you want to shake up your smoking routine, satisfy your sweet tooth, or try something new, flavored rolling papers might be the answer. But, whether you’re a newbie to the roll-your-own (RYO) lifestyle or in the pro ranks, there is a lot to learn about the tasty papers, from the flavors to the sizes, brands, and where to buy them. To save you from having to pore over online pages for hours to try to learn everything there is to know about rolling papers, this is the ultimate 2019 resource on flavored skins for your weed. What are Flavored Rolling Papers? 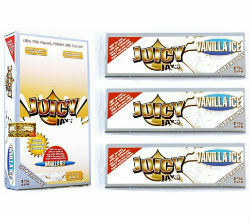 Flavored rolling papers are designed to enhance the natural taste of rolling papers. The fruity flavor can complement the weed wrapped within it and give you more flavor from your chosen strain. As a result, you get a smoking experience that is delicious and different than the norm. Whether you want to spice up your RYO routine or crave a sweet treat, this type of paper might do the trick. Plus, if you tend to get the munchies, they can help tide you over until you can get to some real food. 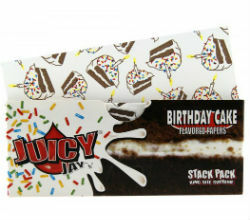 And if you want to dress up your smoke for a special occasion, flavored rolling papers are an easy way to do so. As for where the flavor is on the paper, there are two possible options. The first choice is flavoring in the gum line only. 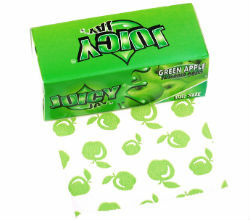 The second option is the entire paper having flavor, including the gum line. 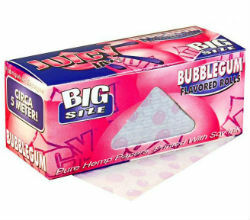 Most flavored paper brands only have flavor in the gum line. 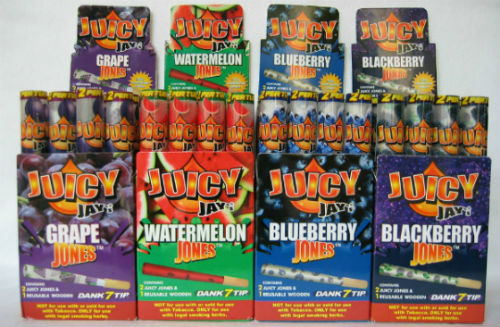 The only exception is Juicy Jay’s, which has all-over flavoring. A big benefit of the latter design is that it excites all of the taste buds in the mouth, rather than just the ones on the tongue. 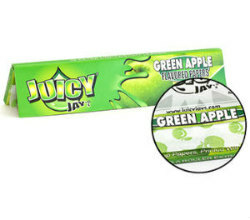 Juicy Jay’s uses an original triple-dip method that infuses the taste into the colored rolling paper, and smokers retain the flavor on their lips after the smoke. Flavored Rolling Papers – More Than 30 Flavors! Not all flavored rolling papers are made of the same materials. Always check the package details before purchase to make sure you know what kind of paper you are buying. More and more people prefer to smoke natural rolling papers in 2019 as they do not want to inhale chemicals. Natural papers also appeal to people who want to protect Mother Earth. Many of the flavored rolling papers on the market are hemp-based. 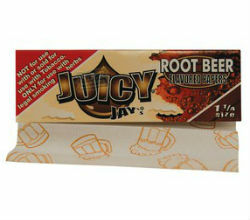 For example, Juicy Jay’s features several sizes and flavors of hemp rolling papers with natural sugar glue. Of course, not all tasty papers are made by the same brand or made of hemp; other papers may be made of flax, rice, or other materials. As for what types of flavors are available for rolling papers, there are more than one can even imagine when first learning about the roll-your-own experience. There are the fruity ones like Apple, Banana, Blackberry, Blueberry, Cherry, Coconut, Grape, Mango, Orange, Peach, Pineapple, Raspberry, Strawberry, and Watermelon. Mint is another popular choice. Also available are some unexpected choices, such as Birthday Cake, Bubblegum, Marshmallow, and Root Beer, as well as alcohol-inspired varieties like Blackberry Brandy, Jamaican Rum, and Tequila. Other surprising choices are Absinthe, Licorice, and Maple Syrup. There are even Sampler Kits of flavored rolling papers. Buying the skins this way enables you to sample different flavors without having to buy multiple packs, which saves you money, time, and effort. If you find that you like a particular paper after trying it in an assorted pack, you may decide to get a whole case of it. The choice is yours. 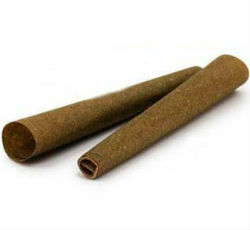 As with other kinds of hand-rolled papers, the flavored ones come in a range of sizes to suit different preferences. 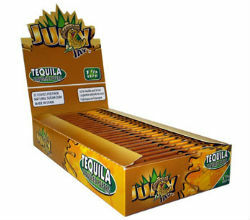 The most popular sizes are 1 1/4 Flavored Papers, King-Size Flavored Papers (including King-Size Slim) and Flavored Paper Rolls. The exact lengths, widths, and thickness of the papers can vary by brand. In other words, just because you select a flavored paper does not mean you are limited to only using one size. 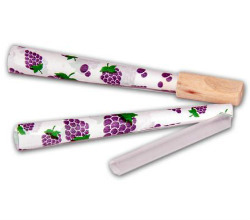 You can also buy delicious smoking paper rolls that allow you to make the joint as long as you want. 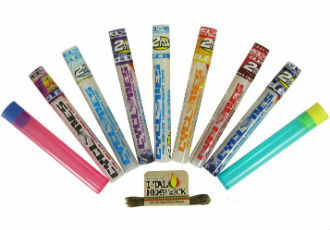 Flavored Pre-Rolled Cones are also available. 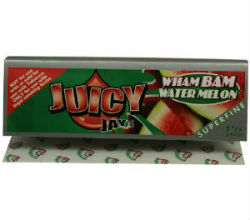 Juicy Jay’s papers are by far the most popular brand of flavored rolling papers around the world. 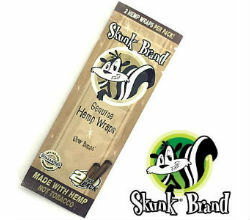 But there are other brands that still have a respectable share of the market, including Skunk Brand and Cyclones. 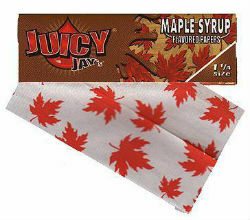 Juicy Jay’s is part of the well-respected Rolling Supreme family and has its roots in the United States. These RYO papers are triple-dipped for full infusion of the flavor into the hemp paper and feature all-natural sugar gum. With most of this brand’s papers, you get a thicker paper and a smooth, even burn. There is also 1 1/4 Superfine available if you like the extra fine papers. 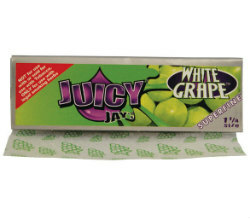 The original watermark on every Juicy Jay’s paper prevents it from running. These papers look different than flavored skins from other brands as they have a printed pattern on each one to match its flavor (the ink is soy based). They offer the popular sizes and a range of flavors. More than 20 flavors are available, from the traditional fruity (Raspberry and Very Cherry, to name just two of them) to the unusual (including Root Beer and Birthday Cake). 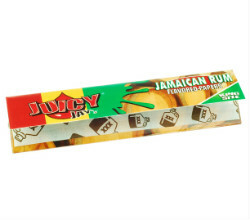 Juicy Jay’s Jamaican Rum 1 1/4 Regular Rolling Papers taste like fine rum from the Caribbean itself. The Superfine line includes White Grape, Sticky Candy, Vanilla Ice, and Black Berrylicious. 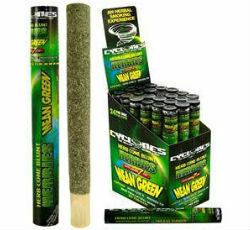 For pre-rolled cones and blunts, Cyclones is an innovator that cannot be ignored. 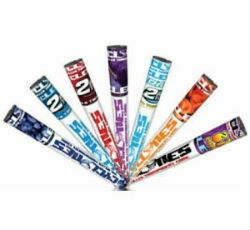 They were the first brand to bring flavored pre-rolled cones to the market in 2003 and were an instant success. Cyclones stands apart from other brands with its clear cones made of natural cellulose fiber (don’t worry, it’s safe to smoke). This material makes for a smoke that is even-burning and smooth. 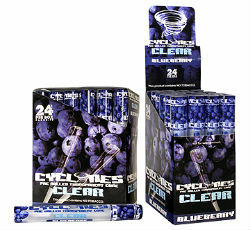 The clear cones are pre-rolled, full of yummy flavor, and aromatic. The delicious flavors include Mango, Blueberry, Chill Red, Chill Blue, Ice Dream, Grape, and Pimperschnapps. 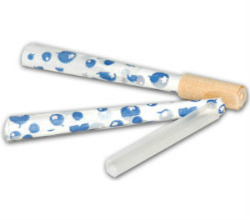 The taste builds on the weed within the transparent cone, and it is a fun variation from the everyday joint. Plus, the Cyclone cones are pre-wrapped, so you won’t have to hand-roll and then wait for the wrap to dry. Experiment with different flavors to see which one you like the best. 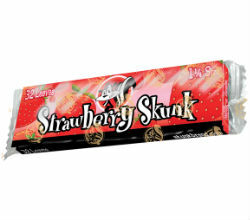 Skunk brand started in 1995, making it one of the first rolling paper companies out there. The papers, which are made in Alcoy, Spain, are 100 percent hemp with natural gum. 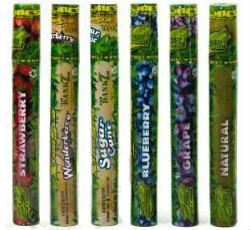 The flavors include Blackberry, Blueberry, Hawaiian, Strawberry, and Menthol. If you get the menthol papers, try using mentholated filters with them to enhance the flavor. 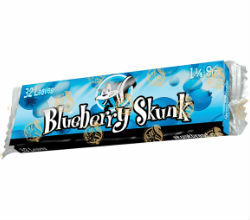 Each Skunk flavored pack comes completely sealed to maintain the flavor’s freshness. This brand is known for being slow-burning and is particularly popular in Europe. Several flavors are available from Zig-Zag, including orange, vanilla, and grape. 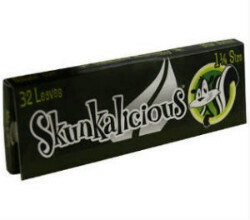 These roll-your-own papers are made from natural flax plant fibers with a natural Arabic gum line. The company began in 1879 in Paris, and they invented the interleaving method of packing papers that became widely used by rolling paper companies around the world. One of the most well-known papers is Zig-Zag Orange 1 1/4. It is a thin paper, so it burns slowly. Given its thinness, this one is not well-suited for novice rollers. 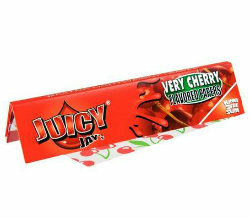 A beginner would do better with a free-rolling or thicker paper from Juicy Jay’s. Rizla was the first brand to unveil flavored rolling papers. Today, the papers can be bought in more than 120 countries. This brand is well-respected amongst those who favor handmade joints. One of their most popular skins is Rizla Liquorice Single Wide. The rice paper is thick, to help enhance the taste, and features an Arabic gum line. Interestingly, the sweet taste of any brand’s liquorice paper is derived from the root of the Glycyrrhiza glabra plant. This plant is native to parts of Asia and southern Europe. The plant must be between two to three years old to be successfully harvested. The E-Z Wider cigarette rolling brand dates back to 1971. The name was inspired by the movie Easy Rider, which starred Jack Nicholson and Dennis Hopper. The rice papers include fun flavors like Wild Berry and Pina Colada. 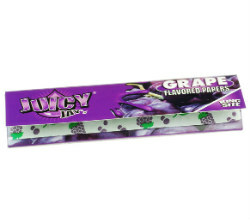 Grape is another popular choice, and the paper tastes like real grape. 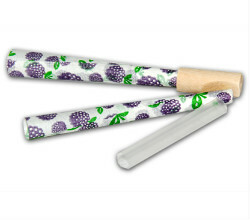 The E-Z Wider 1 1/2 Grape Flavor Rolling Paper provides extra width for anyone who likes having a larger paper. It is not overly thin, which means it appeals to beginners, advanced RYO smokers, and everyone in between. Back in the 1970s, Bob Stiller created Joker rolling papers. 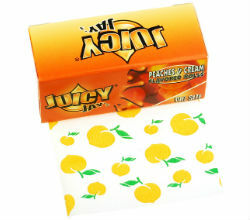 Within the product line are flavored rice papers, including Joker Orange King Size and Joker Orange 1 1/4. It is thinner than some of the other Joker papers, and the size is great for getting longer smokes. Other flavors are strawberry and pina colada. Joker papers are primarily popular in the U.S. and Canada, although they are available in Europe too. The tasty skins are made in Belgium. 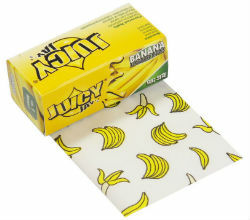 Another brand offering liquorice rolling papers is Swan. They only offer this one flavor for their rolling papers, though. The liquorice skins are made of natural textile fibers, rather than harsher chemicals and have a natural gum strip. They have cut corners to simplify the hand-rolling routine. If you want another option for flavored papers, there is RIPS. This brand dates back to the 1970s, and they originated in the United Kingdom. 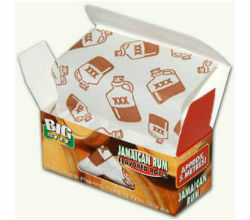 RIPS introduced flavored papers to their product line back in 2006. RIPS offers rolls in individually-sealed boxes. This type of packaging is specifically designed to lock in the flavor. The flavors include cherry, cola, banana, chocolate, strawberry, mint, and grape. The rolls of rice paper with natural gum come in a range of lengths and widths. 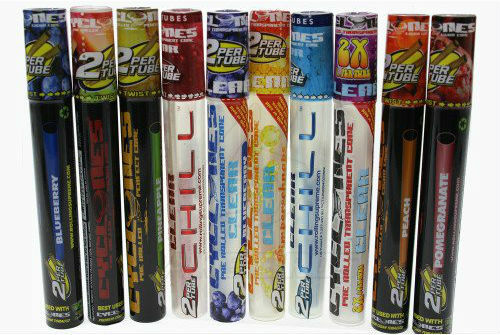 Flavored Blunt Wraps, Flavored Pre-Rolled Cones, Flavored Paper Rolls, and Flavored Drops are also available. 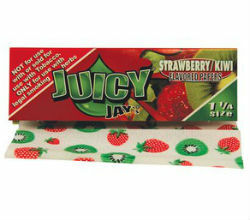 The pre-rolled cones from Juicy Jay’s, for example, come in 1 1/4 Size. They are a great choice if you are not confident yet in your hand-rolling skills or have joint issues that make it difficult to craft a tight roll. 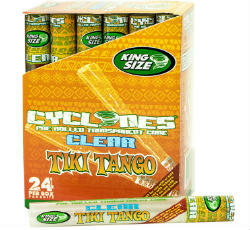 Cyclones flavored pre-rolled cones come in various sizes and wide range of flavors. 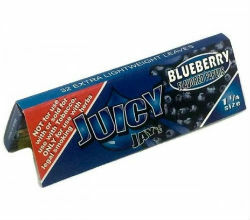 The Juicy Jay’s flavored pre-rolled cones line includes Blueberry, Watermelon, Goomba Grape, and Blackberry. 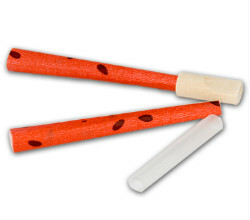 The two-pack of cones come with pre-soaked wooden tips that are infused with the flavor using their revolutionary triple-dip system for enduring flavor. 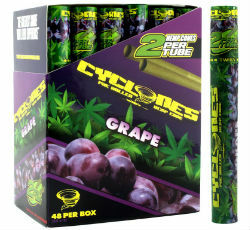 Cyclones are available in more than 10 flavors and also have a flavored pre-rolled cones sampler kit that’s particularly awesome. Another option is Flavored Paper Rolls. They give you total control over the length of your joint. You can decide exactly how much marijuana to use, which can vary from one day to the next, depending on how you feel. In this way, you enjoy more freedom than with a pack of flavored 1 1/4 or Single Wide papers. Finally, you may want to add even more deliciousness to your weed with weed flavoring drops. Each bottle has a certain flavor; simply pick one and add a few drops to your cannabis to get the promised flavor. 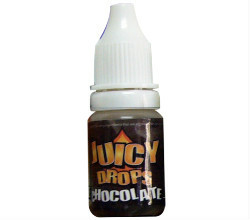 Juicy Jay’s has Juicy Drops which are designed to intensify the smell and taste of marijuana. 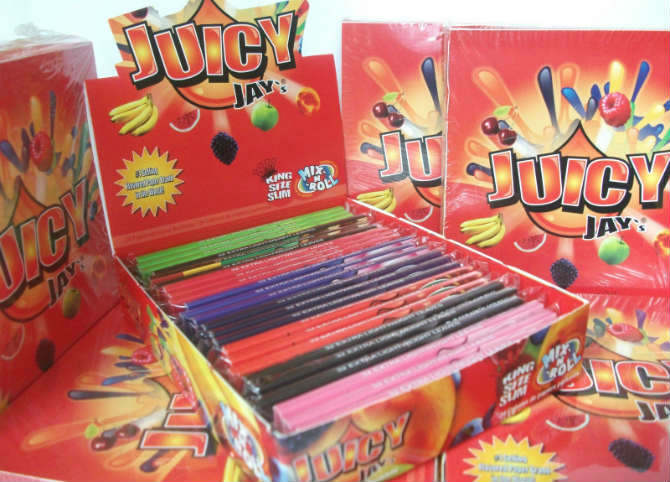 Juicy Jay’s has over a dozen flavors, including Chocolate, Creamsicle, Peach, Strawberry, and Mango. Flavorful rolling papers are growing in popularity alongside the rising number of RYO smokers in developed countries such as the United States, Canada, Australia, and the United Kingdom. The main driver of this trend, according to many analysts, is the amount of money saved on RYO cigs versus factory-made ones because of the lower taxes in many countries. So, a person with little spending money or who is unemployed would likely prefer to hand-roll their joints rather than buy factory-made ones as a way to stay within budget or save money. Also, when you roll a joint by hand, you can decide how much cannabis to use each time. There is also a growing number of medical marijuana users who are into RYO. These patients seek the benefits of cannabis, which range from muscle relief to a cure for insomnia. 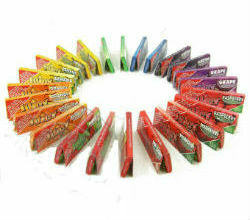 Flavored rolling papers are a fun part of the RYO industry; the flavors provide a break from ordinary paper for smokers. Tasty skins first came onto the market in the early 1900s. 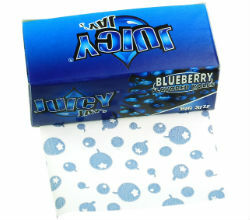 Although rolling papers have been around since the 16th century, flavored rolling papers have not been around as long. The year 1906 was an important one as it was when Rizla launched the first ever flavored rolling papers in strawberry and menthol. When flavored papers first appeared, the cannabis community regarded them as more of an oddity than anything else. 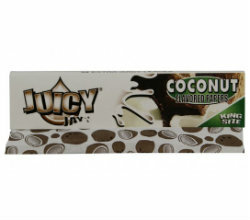 Over the years, they have become more of a mainstay amongst RYO enthusiasts, with Juicy Jay’s becoming an increasingly popular brand. The quality of flavored papers is not considered to be sub-par at all in 2019. The flavors available from different brands have expanded to include more of the fruity flavors, such as raspberry and blueberry. There are also other food flavors, such as chocolate and marshmallow, and an expansion of liquor flavors like rum and brandy. Flavored Papers: Yay or Nay? Still, some smokers refuse to use flavored rolling papers, with many explaining that they think the taste detracts from the natural flavor of the weed. Meanwhile, proponents of these rolling papers insist that they enhance the flavor of the weed. Which side is correct is up to the individual smoker. Another dynamic to consider is what types of flavors appeal to one smoker may not appeal to another person. For example, if you have a sweet tooth, then most of the fruity flavors will likely be welcome. 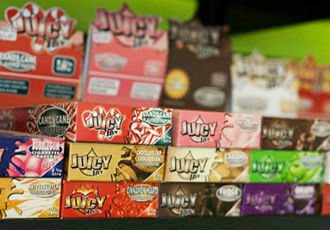 But, if sweets are not high on your list of favorite things, flavored papers may not be something you gravitate toward. 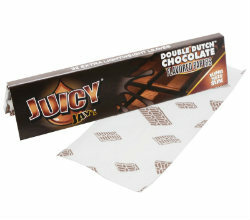 Also, if you tend to get the munchies while smoking, then delicious papers can help you get your fix. 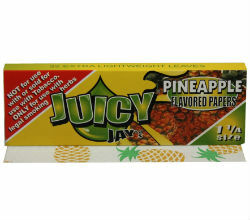 Or if you have poor-quality weed, you may want to get a flavored paper to help elevate the taste of it. 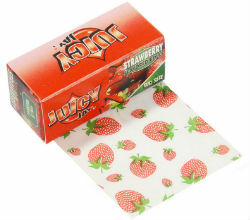 Where to Buy Flavored Rolling Papers Online? The best way to buy flavored papers in 2019 is online because you can shop at your own leisure without having to leave home. But, with new headshops popping up every month, it can make finding a reliable online shop difficult. 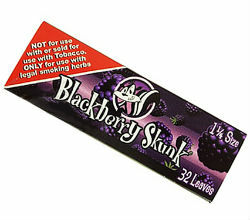 Some headshops develop a bad reputation for carrying counterfeit flavored papers or over-charging loyal customers. To avoid this, it’s recommended to use tried-and-true online retailers like Arizona-based Rolling Paper Depot (RPD) as they stock genuine products, deliver within a reasonable time, maintain a big inventory, and have affordable prices. Buying flavored rolling papers and any other rolling paper online is easy with Rolling Paper Depot because they ship worldwide and accept major credit cards. They ship to the United States, Australia, Greece, Canada, China, Italy, Denmark, France, Sweden, Germany, Netherlands, Norway, and the United Kingdom. For credit cards, Rolling Paper Depot accepts Visa, MasterCard, Discover, and American Express. Packages ship within 24 hours of the order placement or the next business day, and every order is wrapped in discreet packaging. As with anything, the price depends on where you shop. After looking around different head shops, savvy cannabis connoisseurs often conclude that Rolling Paper Depot has competitive prices on flavored rolling papers. 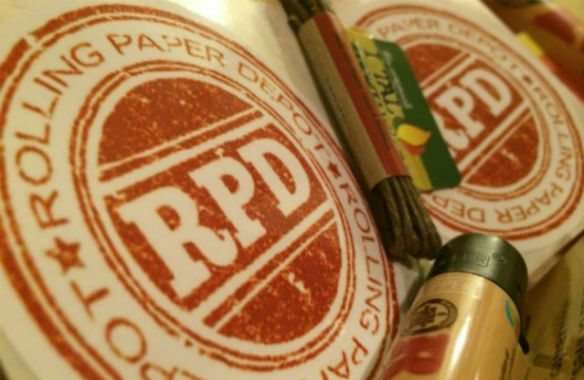 If you find a lower price at another authorized shop, just let RPD know, and they will sell you the flavored paper for the lower price. That’s a guarantee you can get behind! They respond to messages in a reasonable time. When you want to dress up your cannabis or have an alternative to ordinary rolling papers, it’s nice to have the option of flavored rolling papers. There are delicious flavors available that vary from fruity to candy or alcohol-inspired. 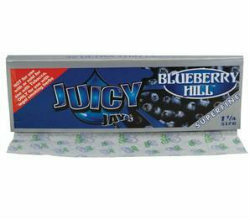 While Juicy Jay’s is a leading brand of flavored rolling papers, there are others out there in 2019. 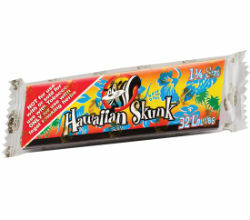 Examples are Cyclones and Skunk, to name just a few of them. The sizes available for these tasty papers are the same as for ordinary rolling papers, so there is not a restriction in this regard. When it comes to adding some excitement to your roll-your-own routine, flavored papers can be an effective solution. You can alternate between different brands, flavors, and sizes of papers as you wish, as well as experiment with cones, drops, wraps, and rolls. One day you might embrace maple syrup skins, while the next day is all about strawberry. 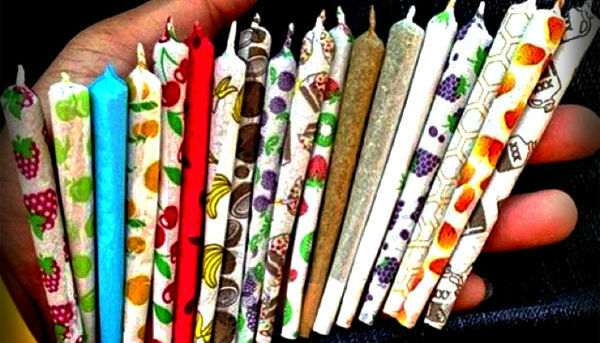 With so many choices to be had, you can never tire of smoking weed. Sampling the different options is a great way to figure out what you like (and don’t like), as well as determining which flavors complement your favorite strains of weed. You might even decide to get a pack of assorted flavors to try a bunch of skins at once. For an RYO enthusiast, flavored rolling papers can certainly enhance your cannabis smoking experience! Want to expand beyond flavored papers? Check out the Rolling Papers Buyer’s Guide to learn more about other brands, shapes, sizes, and more! Rolling Papers - A guide to choosing the best rolling papers: from the best rolling paper brands to materials, shapes, and sizes. 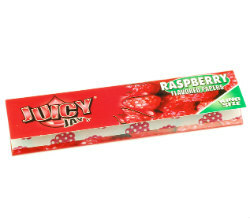 Juicy Jay’s Rolling Papers - A review of Juicy Jay's rolling papers: flavors, sizes, history, and more. Pre-Rolled Cones - A complete guide to pre-rolled cones: the best brands, flavors, sizes, and more. RAW Rolling Papers - An in-depth review of RAW rolling papers, pre-rolled cones, and accessories. Shine 24K Gold Rolling Papers - A review of Shine papers: do gold rolling papers live up to the hype?